Following on from my mammoth post about our trip to the Christmas Markets in Cologne courtesy of Germanwings and 9Flats.com, I thought I’d share some of our highlights and I have a great giveaway too. It will probably come as no surprise to you that one of the first things I was looking out for was the food, and I certainly wasn’t disappointed. The markets themselves were packed full with different things to try from hot smoked salmon smoked over wood fires to chocolate dipped fruit (although it may sound odd, the white chocolate dipped pineapple was very good!) and every type of Bratwurst dish you could imagine. 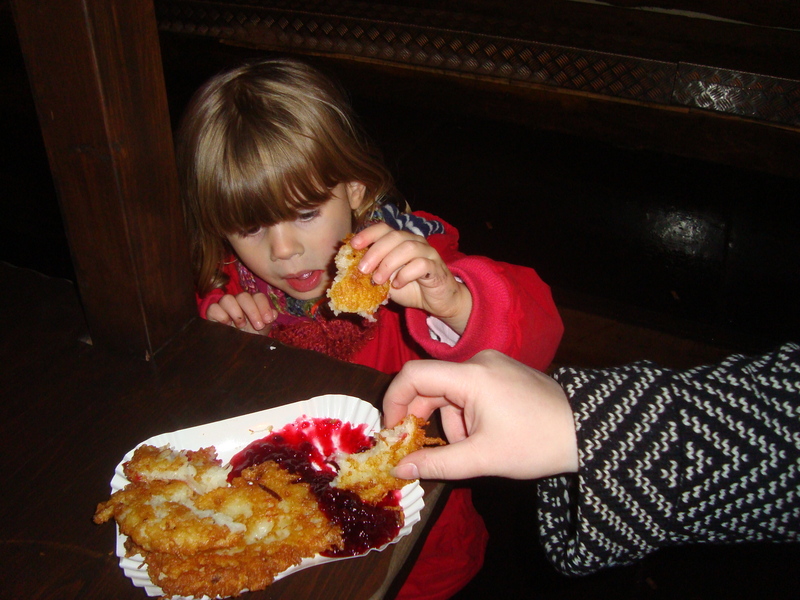 Faith and I loved the potato cakes, which were fried and served with cranberry or apple sauce. I also fell in love with all the bakeries, selling a vast array of delicious looking cakes and pastries. Pure heaven for a foodie! 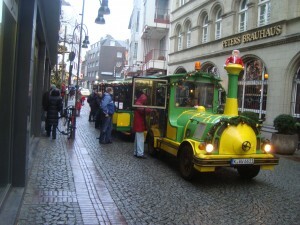 This little green and yellow land train was one of Faith’s highlights of the trip. 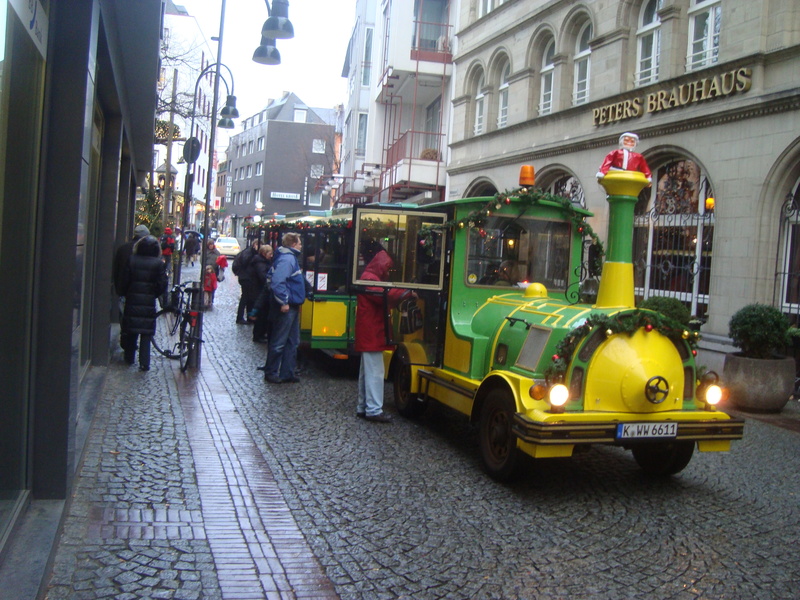 She loved travelling between the markets on it – it takes you to four of them, and for 7€ per adult and 4€ per child for a hop on, hop off round trip, it didn’t break the bank. We also had fairly wet weather and a child with little legs so it was ideal for us – especially as the stop at the Chocolate Museum was just opposite our apartment! The Christmassy music they played on it was a bonus too. 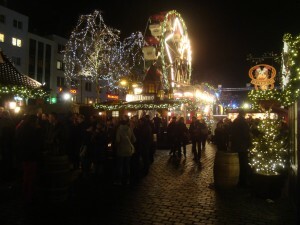 I’m not exaggerating when I say the atmosphere at the Christmas Markets was magical – especially at night. Everywhere was lit up with pretty lights and the whole place was alive with people. The Glühwein stalls were packed with people enjoying chats with friends. On the whole, it felt like a very safe and festive place to be wandering around and whilst it was busy, it was rarely too crowded. The children were mesmerised by the amount to see and do and the traditional carousel was a huge hit. 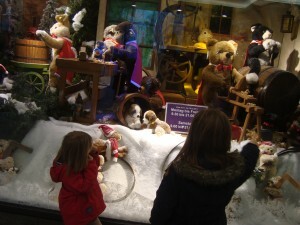 The children absolutely loved the beautiful window displays at the Galeria Kaufhof store, which were decorated with a Christmas theme featuring Steiff soft toys. It was really well thought out, with lots of moving toys and so much to see the childrens’ eyes nearly popped out. We were also pleased that they enjoyed this so much as it is free! I could go on and on… but I won’t! I think you get the picture – there was tons to see and do and a fabulous time was had by all. Visit their website and leave me a comment to tell me which destination you would choose to jet off to. They don’t just fly to Germany, there are many other destinations from several UK airports. Make sure you leave your name and a way of contacting you (you can leave your email address as one of the options when you comment so that it is only visible to me, not the general public) – I will then pass the winner’s details onto Germanwings who will sort out your flights for you. The giveaway will be open until 10am on Monday 9th January 2012 and the winner will be notified as soon as possible after this date. Entrants must be 18 or over and be resident in the UK. The winner will be the first entry picked at random. Winner will be notified in writing with full details. Maximum 2 entries per person (one comment, one tweet). No purchase necessary. The judges’ decision is final and binding and no correspondence will be entered into. There is no cash alternative. 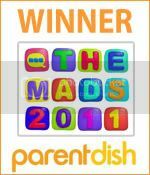 The prize must be taken subject to availability, any time before 31 December 2012. Winner must arrange their own travel insurance and passports must be valid for a minimum of four months from date of departure. The winner must cover any additional costs relating to travel (e.g. hotels, transfers, meals, in-flight food and beverage). One piece of hold baggage included per passenger, per sector, up to a max weight of 20kg per bag. Once booked, flights and changes are subject to the Germanwings terms and conditions. See www.germanwings.com. Hi Amy, your trip to Cologne sounds amazing! I’d love to visit the markets at Christmas-time, but think if I won your competition I’d love to fly to Rome to check out the authentic Italian pasta and gelato! I love the Christmas Markets used to go with my Mum and friends each year pre-kids! !the last ones I visted were In Prague went with OH when pregnant & was fab. Lots of great options, but berling is one of my favourite cities, so I’d have to go for that! Its been many years since I last went to a Christmas market in Prague, but it was magical. I like the sound of the potato cakes served with cranberry or apple mmmm delicious. Difficult to choose from the list of cities but possibly Barcelona. I’m itching to go to Athens this year! I want to go so much. It’s the old buildings, I’m nuts for the old buildings. What a great trip….and giveaway! I’d love go to Rome…its all about the food of course!